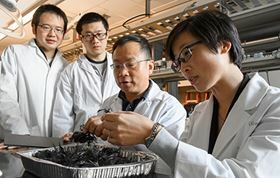 Jinwen Zhang with his carbon fiber recycling research team. Carbon fiber products can be difficult to break down or recycle. It is possible to grind them down or break them down with very high temperatures or chemicals to recover the carbon fiber. However, the carbon fiber can be damaged in the process and they can also destroy the matrix resin materials in the composites. In this project, Jinwen Zhang, a professor in the School of mechanical and materials engineering, and his team developed a new chemical recycling method that used mild acids as catalysts in liquid ethanol at a relatively low temperature to break down the thermosets. To break down cured materials, the researchers raised the temperature of the material so that the catalyst-containing liquid penetrated into the composite and broke down the complex structure. Zhang used ethanol to make the resins expand and zinc chloride to break down critical carbon-nitrogen bonds. The researchers were then able to preserve the carbon fibers as well as the resin material in a form that could be easily re-used. They have filed for a patent and are working to commercialize their methods. The research was reported in the journal Polymer Degradation and Stability. This story is reprinted from material from WSU, with editorial changes made by Materials Today. The views expressed in this article do not necessarily represent those of Elsevier.